Sustained economic growth will be possible only if an expanding economy can find needed workers. A relatively low labor force participation suggests that there may be more unused labor that standard measures indicate. The non-employment rate from the Richmond Fed uses employment transition rates to construct a more accurate measure of unused labor. The hope of faster economic growth is a major factor behind the upturn in markets since the November election, but where will an expanding economy find the workers it needs? If it cannot find them, then any stimulus from tax cuts, regulatory reform or infrastructure spending risks turning into inflation rather than healthy growth? Some observers place their hopes on tapping the reserve of workers who have left the labor force. 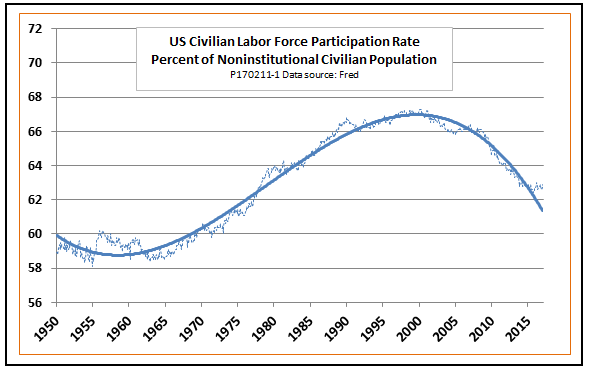 As the following chart shows, the percentage of the population who participate in the labor force has fallen from its peak of around 67 percent in the 1990s to about 63 percent today. One way to thread this needle is to tap the huge number of workers - as many as 10 million, as the charts above suggest - who have left the workforce. Lower corporate income tax rates and reduced regulatory burdens would create new incentives for businesses to expand, and cutting marginal income tax rates would create new incentives for people to rejoin the labor force, by offering them more wage bang for their work buck. Let people keep more of what they make and they will likely be more willing to work more, or go back to work. The short-term unemployed, out of work for 26 weeks or less, have a 30 percent probability of finding a job within the next month in a good year and a 22 percent probability in a bad year. The long-term unemployed, who have been out of work for more than 26 weeks, but who have actively looked for work within the last month, have a transition rate of 16 percent in a good year and 10 percent in a bad one. Discouraged workers, who have looked for work within the past year but not the past four weeks and who give lack of job prospects as the reason for not continuing to look, have a transition rate of 17 percent in a good year and 11 percent in a bad one. Other marginally attached workers, who have looked for work in the past year but give other reasons for not looking more recently have a transition rate of 15 percent in a good year and 10 percent in a bad one. People who say they want a job, but are not counted as marginally attached because they have not looked for one in more than a year, have a transition rate of 16 percent in a good year and 12 percent in a bad one. People who are out of the labor force and say they do not want a job, but are not disabled or retired, have an 8 percent probability of finding work in the next month in a good year and 6 percent in a bad year. People who do not want a job and are disabled or retired have the lowest transition rates, with probabilities of returning to work of between 1 and 2 percent in any given month. There are some surprises here that support the views of optimists like Grannis. In particular, we note that discouraged and marginally attached workers, who are excluded from the government's official U-3 unemployment rate, are actually more likely to find a job in a given month than are the long-term unemployed, who are included in U-3. In that sense, they do represent a genuine untapped reserve of labor. First, the pool of potentially available labor really is larger than indicated by the standard unemployment rate. That can be seen from the fact that the NEI is higher than U-3, regardless of the stage of the business cycle. Second, the official unemployment rate appears to have overstated the spike in unused labor during the worst years of the Great Recession. 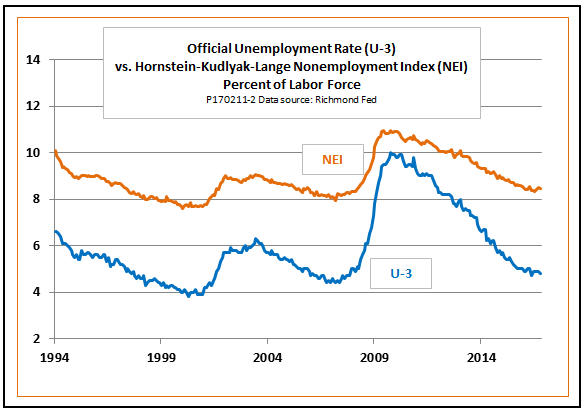 The spike in U-3 is so much sharper than that in the NEI largely because the official rate puts too big a weight on the long-term unemployed, who have low transition rates. Third, although the NEI shows a larger pool of untapped labor than U-3, the labor market has tightened considerably during the recent expansion regardless of which indicator you go by. Both U-3 and the NEI are now approaching their pre-recession lows. The bottom line: The non-employment index confirms the optimistic view that there are reserves of unused labor that the standard unemployment rate does not adequately measure. However, much of that labor reserve has already been used up as the expansion has progressed. Pushing real GDP growth to sustained levels of 3 to 4 percent, as some hope to do, will be possible only by forcing the non-employment rate to historic lows.